UVSE Budapest (HUN) won the LEN Trophy for the first time in its history after hard-fought wins over fellow Hungarian side Dunaujvaros in the semis, then a 7-6 nailbiter against Padova (ITA) in the final, held in Budapest (HUN). UVSE, runner-up in last season’s Euro League, got some fine consolation after bowing out from this year’s EL quarters and having to settle for playing in the LEN Trophy Final Four. 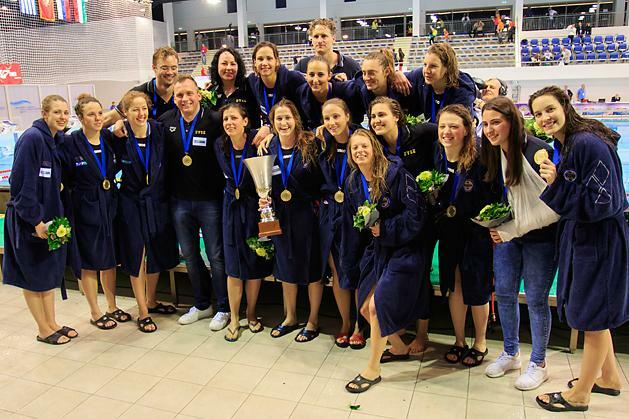 The host club didn’t disappoint its fans in the Tuske Pool in Budapest as they won a thrilling final over Plebiscito Padova. An eventful first period saw the Hungarians scoring three straight goals after going down early, thus they went 4-2 up from 1-2, netting two in the last 77 seconds. Goals from the centre at both ends maintained the gap for halftime (5-3), then a crucial man-up goal from Hanna Kisteleki gave a 6-3 lead to UVSE early in the third. Still, the visitors pulled two back late in this period, in a span of 33 seconds but it was Kisteleki again who sent the ball home with 0:10 remaining on the clock (7-5). The final quarter brought enormous fight, though saw only a single goal. It came 1:51 minutes from time, Dara Sara netted a 5m shot for 7-6. UVSE struggled in front but could hold on in defence and after a missed Italian attempt 8 seconds before the end the hosts could start celebrating their historical first European trophy. Dunaujvaros finished the tournament on a higher note among the semi-final losers. The Hungarians thrashed Ugra (RUS) in the bronze medal match, with a devastating 6-1 second period they downed the Russians and never let them back into the match to earn a 17-10 win. A day earlier the semi-finals were mostly chasing games as both winners jumped to a big lead early on, but they were almost caught by their respective rivals. In the all-Hungarian contest UVSE went 3-0 up in the first but Dunaujvaros hit back and late in the third they took a 4-5 lead. At 5-6, in the fourth, they missed a crucial man-up to double their lead and in the remaining minutes only the hosts could score. They did it three times in a row – each came from 6 on 5s – while their opponents were unable to find the back of the net in the last 6:42 minutes. In the other semi-final Padova ruled the match in the first half, they jumped to a 5-0 lead, the first Russian goal came after 16:50 minutes. However, some more were added in succession, after 7-1 Ugra netted five connecting goals, with 5:47 to go they trailed only 7-6. But an immediate answer killed their momentum, at 3:48 the Italians were 9-6 up again and the excitements were over. Now the Magyar clubs stand with two wins in two finals held in Budapest so far this season: after Ferencvaros had captured the men’s Euro Cup, now UVSE added another trophy to the Hungarian treasury. Though this run will be halted soon as in the line of the European cup finals next comes the women’s Euro League Final Four tournament in Kirishi (RUS) on 28-29 April, featuring CN Sabadell (ESP), Olympiacos Piraeus (GRE), Kinef-Surgutneftegas Kirishi (RUS) and Mataro (ESP).